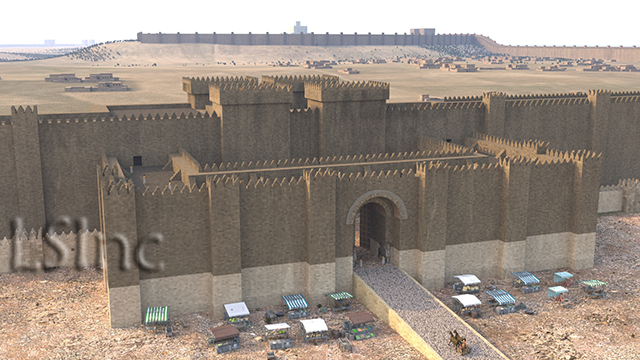 The Nergal Gate is located in the western part of the northern section of the Nineveh city wall (see the city map at the left; hover over to enlarge). The gate was built by King Sennacherib around 700 BCE as one of between 15 and 18 gates he built around his new administrative capital city. 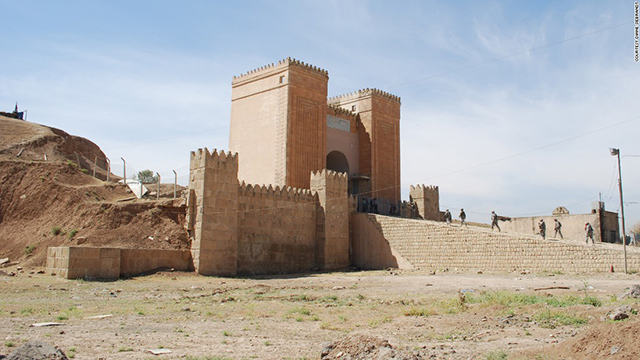 The gate, containing the last fully preserved colossal guardian winged bulls in Nineveh, along with the preserved city walls were destroyed by ISIS/Daesh earlier this year (2016). Digital documentation and reconstruction are important counterpoints to deliberate acts of destruction meant only to erase a culture and its physical remains from the pages of history. Learning Sites is doing its best to help preserve Assyrian monuments so that future generations can appreciate them, future students can learn from them, and future scholars can continue to study them. 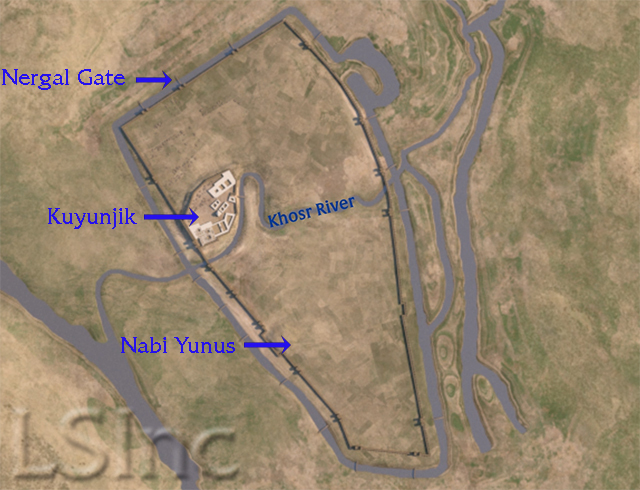 At the left is a view of the Nergal Gate as it looked in 2008 (photo from a CNN news article on the destruction of sites by ISIS in 2015; hover over to enlarge). The view shows the gate as it was (probably mistakenly) reconstructed by the Iraqis in the 1950s, although the ramp and enclosing walls do seem to follow excavated evidence, while the position and decoration of the outer gateway towers do not. 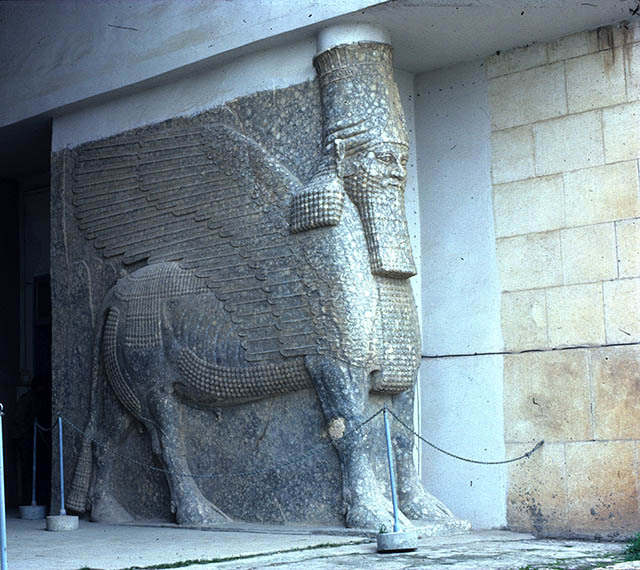 A nearly fully intact colossal winged guardian animal from the western side of the outermost gate as it looked in 1981 (photo courtesy of John Russell; hover over to enlarge); the eastern animal had only partially survived (these two were only discovered in the 1940s). The other guardian animals from the two entries of the inner gate (known since Layard's excavtions) had survived to even a lesser degree. 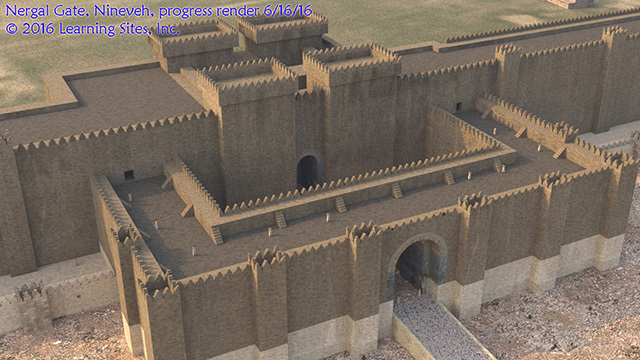 The immense gate complex (hover over our reconstruction rendering at the left to enlarge) had walls 15m thick and towers 30m high. Most of the walls were fired brick but the outer circuit wall had lower sections of stone. 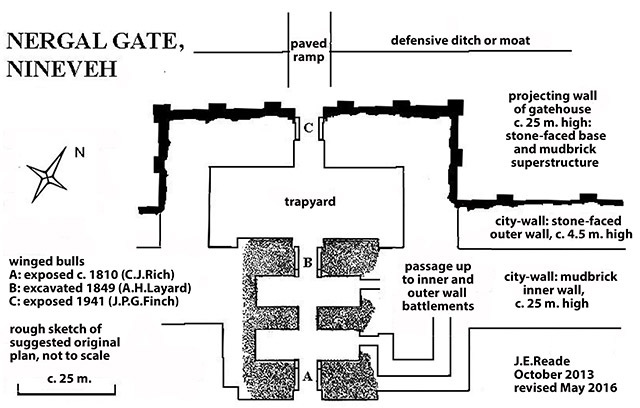 The configuration included an inner "trapyard" to that would have allowed defenders to surround and kill any enemy troops who might have breached the outer gate. Each of the three entries (one in the outer gate, and two in the inner gate) were guarded by colossal winged guardian animals, that had survived in varying degrees of completeness until the spring of 2016, when the gate, animals, and city walls were deliberatly bulldozed to ruins by ISIS/Daesh. The plan at the left (hover over to enlarge) was drawn for us by Julian Reade based on his research and our joint discussions. Our digital reconstruction (and as normally happens when 3D models are accurately built) brought to the fore and then clarified confusing and previously unimagined details of the gate. View of the Nergal Gate in context of the rest of the city. The citadel of Kuyunjik (housing Sennacherib's Palace without Rival) is in the middleground, with its ziggurat rising above the walls (hover over image to enlarge). The gate must have been a fearsome sight for anyone approaching it (hover over image to enlarge). 1948 "The Winged Bulls at the Nergal Gate of Nineveh," Iraq 10.1:9-18. 1853 Discoveries in the Ruins of Nineveh and Babylon. London: J. Murray. 1849 Nineveh and its Remains. 2 vols. London: J. Murray. (forthcoming) "The Nergal Gate and South-West Palace at Nineveh: appearances and disappearances in the late Ottoman period." 1998-2001 "Ninive (Nineveh)," v.9, p.402 in Erich Ebeling, Dietz Otto Edzard, Gabriella Frantz-Szabó, Bruno Meissner, Wolfram von Soden, and Ernst Weidner, eds. Reallexikon der Assyriologie und Vorderasiatischen Archäologie. Berlin: Walter de Gruyter.